The 24×48D/H Dutro platform truck features fixed handle, powder coat finish and 8" mold-on rubber ball bearing heavy duty casters. Constructed of 12 gauge material with 2” x 2” x 3/16” angle cross braces for caster mounting. Features rounded corners and recessed handle sockets on all four corners to help protect merchandise, personnel and buildings. Removeable handle for easy storage. A huge 1500 lb. 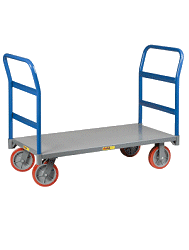 capacity and large 24 x 48" platform allows for moving of heavy large cargo. Made in the USA!